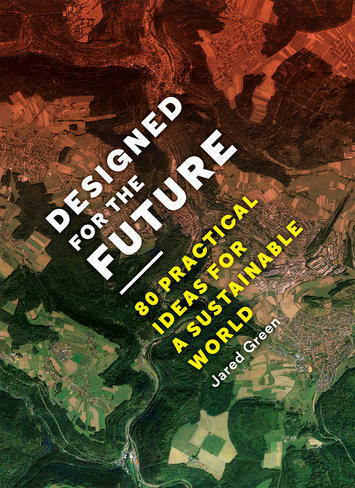 By the fifth word of Designed for the Future, Jared Green had almost lost me. By the end, he hadn’t quite gained me. This slim, visually interesting handbook presents “80 practical ideas for a sustainable world” from the noted author of The Dirt, a weekly blog sponsored by the American Society of Landscape Architects. Green’s earnest mission is to find hope for the future, and with this book, he edits a collection of essays that points to some projects that do. It is a slim, portable, affordable book for the busy design professional in any discipline who is trying to wrap his or her head around the slippery notion of sustainability. Green’s introduction summarizes his process, and then presents each idea in a two-page spread. The ideas range from using mushrooms, which are now compressed into insulation panels (don’t eat your wall), to Rome as an example of walkable urbanism (don’t tell the taxi drivers). Each idea is presented with a photograph and a neat summary of how it contributes to the future. The point of all this activity, however, remains elusive in this otherwise intriguing little book. Designed For the Future poses the question to eighty thinkers: "What gives you hope that a sustainable future is possible?” Each replies with a brief description of a project that inspired them to see a way forward. Among the notable but not entirely successful attempts to provide an answer is an essay by Elizabeth Mossop, “Changing Course,” about a design competition to improve management of the Lower Mississippi River in Louisiana. She notes that up until now the river, managed by scientists and engineers, has lost wetlands and added pollution to the Gulf of Mexico. Giving designers a turn might be a good idea, as she suggests. While I’m sympathetic, I keep thinking of the woeful mismanagement of the Everglades in my home state of Florida, and how often well-intentioned healing practices seem forever delayed. It is as if we cannot collectively bring ourselves to veer off our current pathway, no matter who is in charge. Some essays, however, are the real thing. “Project Row Houses” by F. Kaid Benfield showcases artist Rick Lowe’s community development project to preserve 22 wood-frame shotgun homes in Houston. The project uses buildings that are already built, improving them rather than replacing them; it provides dignified shelter for historically disadvantaged African Americans, and has spawned urban agriculture, education, and similar enterprises. This is what sustainability should be all about: taking our stuff and making it better, rather than abandoning it and making more stuff. Many of the essays are somewhat predictable paeans to urban life. “Seven Dials,” by New Urbanist Victor Dover, extols the virtues of this tiny London street intersection and its surroundings. Developed in the seventeenth century, this West End neighborhood has gentrified nicely into a walkable community. The accompanying photo seems too good to be true: pedestrians actively engaged in their public realm, not a car in sight, the sundial festooned with Union Jacks. As a prosperous, white, upper-middle-class community, it is an easy example of the urbanist’s dream come true, but well nigh impossible to replicate in America’s big-box car culture. Perhaps it could survive as a simulated city somewhere. Green’s inclusion of an analysis by Anthony Flint of Unité d'Habitation inspired me. This 11-story apartment block, built in France after World War II, lets daylight in on both sides of each apartment,, and features rooftop uses. It was architect Le Corbusier’s first phase of his Radiant City plan. The design was much maligned in the 1990s by urban activists as a misanthropic disaster, who claimed that traditional neighborhoods were better. But the Unite d’Habitation turned out to be a pretty nice place after all, while many well-intended traditional neighborhood developments have had poor results. There is hope, after all, for modernism. Green’s second-to-last entry is an essay on vernacular architecture by Li Xiaodong, a Beijing architect and professor at Tsinghua University School for Architecture. In some ways, this is the book's most important essay. “It’s about the process, not about design," says Li, adding, "Architecture should be based in a dialogue with local conditions and lifestyles. It should be a product of that dialogue.” Li beautifully captures the essence of sustainability, seeing it as a thought process, not a look or a lifestyle; about reacting intelligently to local conditions with materials and labor available on hand. Green’s examples are heavy on the land planning side of things. Innovations such as 3-D printing are missed, and economics and technology are entirely ignored. And a few essays seem repetitive: Paris is in the book twice. The focus is on people, land, water, and air. Reducing pollution and waste are important, and his book illustrates examples of this in abundance. We seem to have bounced back from the bad old days of the Ohio River on fire and air so thick you can take a bite out of it. This book offers assurance we are not backsliding into the wicked ways of the past. Reducing the amount of stuff we take from the earth also figures big. Densifying cities, which conserves open space, is the topic of more than one essay. Staying local and using renewable, vernacular materials also has resonance with these contributors. Green’s essayists portray a future where resources are extracted a little more gingerly, and open land is conserved and even integrated into human habitation on a small scale to improve our relationship with nature. The classical definition of sustainability includes two other tenets: increasing biodiversity, and spreading a little justice around to other species. The book provides scant evidence that the future holds any hope for these two notions. The wind farm in Lester Brown’s “Wind Mega Complexes” essay even goes against these principles, showcasing the giant wind turbines blamed for bird kills. Regarding biodiversity, Green misses the Mesoamerican Biological Corridor project, an oversight perhaps due to his self-proclaimed “random process” for choosing contributors. Green begins the book with the statement, “We can’t give in to fatalism.” For the symptoms of fatalism, he presents examples of cures. Someone, somewhere, is treating these symptoms, he reassures us, saying that things are getting better in many different ways. A deeper disease, however, lies undiagnosed in this book. Cities are denser, yes; but they increasingly all look the same. Wetlands are saved, yes; but we continue to “manage” them, as if it would be awful if they were left to themselves. Just when public spaces are getting nicer, most Americans prefer to remain indoors, glued to their devices. None of these imply a future of abundance and beauty. Until our own meaning and purpose are more fully addressed by our present society, it seems difficult to conceive of the kind of future envisaged in Designed For the Future.